Autoquip has been the premier North American manufacturer of customized lifting solutions since 1947, and the VASARI™ line of residential parking lifts has been developed and refined to meet the unique challenges faced by homeowners, architects, designers, and contractors when considering personalized, subterranean vehicle lift solutions. Whether the motivation in storing vehicles or watercraft below grade is security, shortage of parking spaces, or a basement level motor-court for a collection of vehicles – VASARI™ subterranean parking lifts can accommodate loads from the smallest jet-ski or motorcycle to the largest SUV or catering van, and can be personalized with variety of platform designs, finishes, and colors. 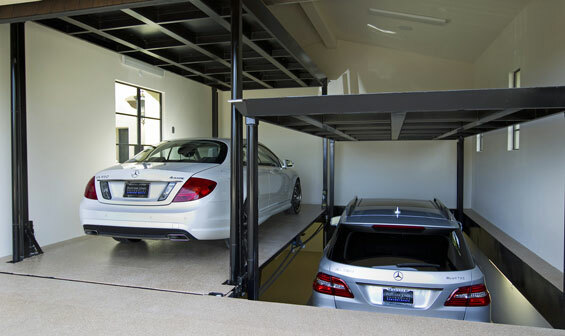 Protect your cars and your save space with a car lift from Morning Star Elevator. Call to see how affordable an investment like this really is!